Crème Eggs With A Difference! My Easter Egg review panel and I may not have liked Artisan du Chocolat’s chocolate Easter egg offerings but oh my goodness, I absolutely must recommend their adorable little “Crème de la Crème Eggs“! These are a clever reinterpretation of the famous Cadbury’s Crème Egg but so much tastier! 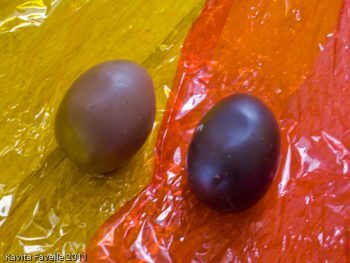 Wrapped in coloured cellophane, like large boiled sweets, the eggs are made from a thick layer of chocolate containing a white chocolate ganache “egg white” and a “yolk” made from apricot and mandarin (in the dark chocolate egg) or passion fruit (in the milk chocolate egg). 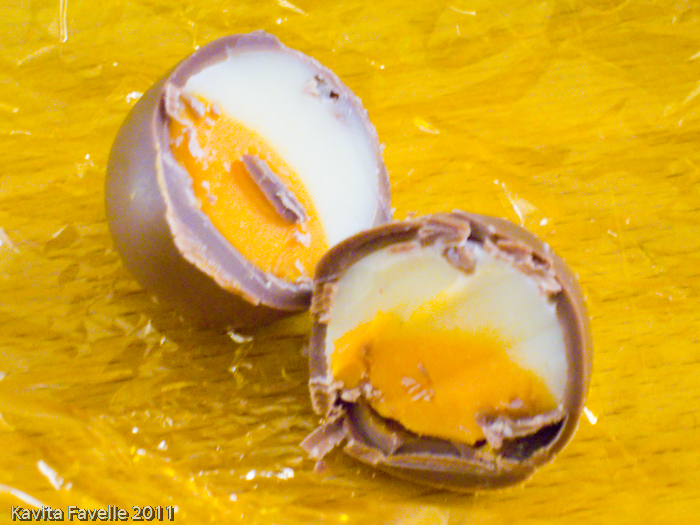 The dark chocolate eggs, with apricot and mandarin were pleasant, but didn’t light my fire. 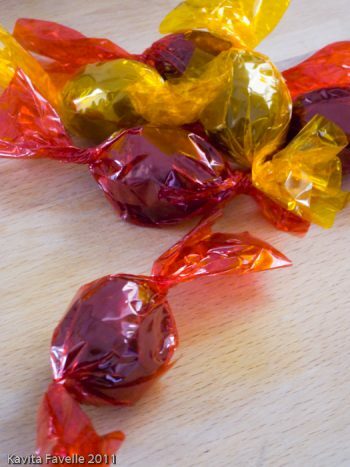 But the passion fruit ones are utterly fabulous. A wonderfully robust and heady tropical fruit flavour, sweet like their name sakes and very addictive. You can buy them from Artisan’s shops or online store for £1.50 each. That may sound like a lot, but in my opinion, it’s totally worth it! P.S. I heard there was a pistachio variant too – and certainly in the product image on their website, there’s a third egg wrapped in green cellophane – but it’s not described or sold on the website. If anyone comes across one, please get one for me to try! 4 Comments to "Crème Eggs With A Difference!" Ah, passion fruit! Reminds me of my visit to you, Kavey, and how we ended up in a nice little place not far from your home and I slurped up two passion fruit juices quickly as they were cold and delicious! Not done a great deal of egg-shopping yet, although I have acquired some goodies to put into my brother's Easter basket whilst marketing at Aldi. Life on the dole, strictly low-brow I fear, but he's happy with what I put together for him. I can't remember any passion fruit juices! We have an Aldi very close by to us now, pop in for bargains regularly. Agree with you, loved the passionfruit filling but found the other rather too flavourless. Would have liked the passion fruit filling in the dark shell…. Let me know if you get hold of a pistachio one, I've certainly not seen any but would LOVE to try one! !